BluePed module for Yamaha Powerdrive is one of the most elegant tuning solutions for Yamaha. The BluePed module is one of the most elegant tuning solutions for electric bikes powered by Yamaha mid-mounted engines. This device can be conveniently controlled via a free Smartphone App. If you use the BluePed tuning tool, your electric bike display will still show all data correctly – even if the device is activated (current speed etc.). The BluePed module takes away your electric bikes 25 km/h speed limit and shifts it up to 75 km/h (about 47 mph). If this may be a little bit too fast for you, you can adjust the maximum speed to a lower level without any problems – in fact, you can set the maximum speed individually from 15 km/h to 75 km/h! As already mentioned, one of the big advantages of the BluePed module is that it can be conveniently controlled with a free Smartphone App (Android or iPhone). First and foremost, you can use the App to change the settings of the BluePed module. 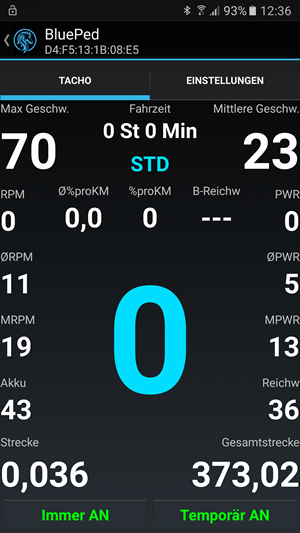 Furthermore, the App can show you not only the current speed, but even many other relevant data on the Smartphone display while you are riding – the parameters are even much more extensive than the data on your electric bikes display! To make sure you always have a good view on your Smartphone display while you are riding, the BluePed module comes optional with a special Smartphone holder for your handlebar! 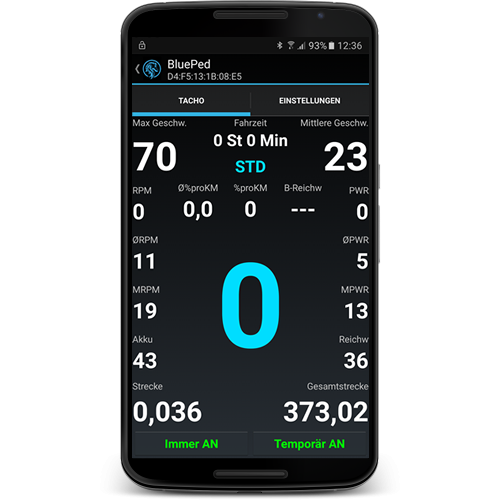 The BluePed module offers you much more setting options than most other electric bike tuning tools: For example, you can you use the App to set the maximum engine support to a self-chosen level or adjust the wheel-size. Furthermore, you got the option to enter a PIN code to protect the BluePed device from unauthorized access. Another advantage of the BluePed tuning tool is that it can be conveniently switched on or off via the light switch of your electric bike display (the original function of the light switch remains unchanged). By the way, the Smartphone and the BluePed will communicate wirelessly via Bluetooth 4.0. Important hint: The BluePed App is only needed to adjust the settings of the BluePed module. Because all settings will be automatically saved, you don´t need to take your Smartphone with you every time you want to use your electric bike (like mentioned before, you can switch the module on / off via your electric bicycles light switch). You can change the settings of the BluePed module or cancel the tuning completely at any time. The BluePed is perfectly compatible with electric bikes equipped with Yamaha engines from 2015 onwards – for example, with electric bikes from Winora (Haibike) or Bulls. Most importantly, your electric bike has to be equipped with the Yamaha display shown below (please note, in the 2016 Yamaha electric bike version the control element at the handlebar has an USB output). Of course, you can set all values back to 0 (zero) whenever you want to. 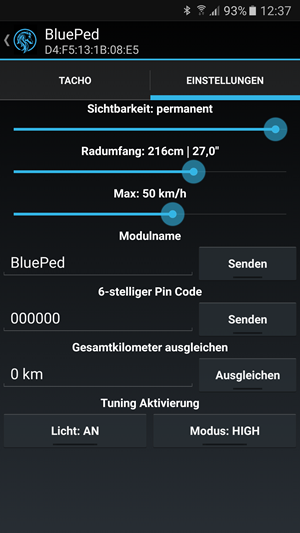 Hint: The function “Gesamtkilometer ausgleichen” (=”offset total kilometres”) enables you to get the original driven kilometres, if you want to uninstall the BluePed tuning tool some day. The installation of the BluePed module is very easy; you can do it at home all by yourself. 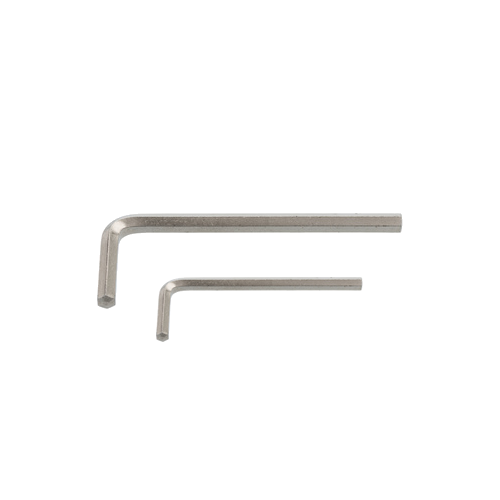 All tools you need are included in the scope of delivery! - Optional 1 FINN Smartphone holder for your bicycle handlebar. - Optional 1 Charging Cable (micro USB to micro USB or micro USB to lightning). Please note: The charging function does not work for all Smartphone types. - Installation guide and operating instructions: BluePed Manual (pdf). Our recommendation: Before you buy the BluePed module, you should download the BluePed App and check out if it runs on your Smartphone (minimum requirements Android 5.2 and iPhone iOS 9.2).